I found what I think is an interesting quote concerning the new KCP in NNSA’s FY 2011 Stockpile Stewardship and Management Plan (which is the plan that NNSA showboats to Congress). This sounds to me like the federal government is walking away from any future obligation to clean up any contamination at the new Kansas City Plant. I think that interesting given how there is no real federal commitment to clean up the old plant which is badly contaminated. The rest of NNSA’s FY 2011 Stockpile Stewardship and Management Plan (summary and Annex A) can be viewed. Annex B and C are classified. If NNSA won’t be burdened for clean-up, who will? Weight Restrictions for Weapons Workers? Question: What is the tripping-man impact scenario for a nuclear weapons production technician? Answer: A 280 lb production technician traveling 2 .5 miles per hour. We are all familiar with the horrible impacts that nuclear weapons have on humans, but now we have an Analysis of Human Impacts on Weapons. The Defense Nuclear Facilities Safety Board (Board) recently reviewed the Hazard Analysis Reports (HARs) for several nuclear explosive operations at the Pantex Plant and found that Plant could have a weight problem with its production technicians (PTs). Of concern is that the weapons design agency supplies data on weapons responses for “tripping-man impact scenarios” based on the energy imparted by a 280 lb PT traveling 2.5 miles per hour. Tools and parts could break if someone larger tripped into a warhead while going faster that 2.5 mph. And Pantex has no controls in place to limit these human impact energies. The DNFSB concluded that the “maximum PT impact energy does not represent an uncontrolled environment, such as lightning, earthquake, or meteorological conditions.” Pantex imposes other physical qualifications for PTs (such as age, sight, speech), as well as other limitations specified by the Human Reliability Program. They believe that weapon responses should be reevaluated for higher impact energies, or that Pantex should limit PT weights. Decades of nuclear materials production at the Department of Energy’s (DOE) Savannah River Site in South Carolina have left 37 million gallons of radioactive liquid waste in 49 underground storage tanks. This is just a small part of DOE’s Cold War cleanup legacy that currently has an estimate of $360+ billion to remediate across the country. This estimate keeps going up. Emptying, cleaning, and permanently closing the 22 underground liquid radioactive waste tanks at the Savannah River Site is likely to cost significantly more and take longer than estimated in the December 2008 contract between DOE and Savannah River Remediation, LLC (SRR). Originally estimated to cost $3.2 billion, SRR notified DOE in June 2010 that the total cost to close the 22 tanks had increased by more than $1.4 billion or 44 percent. Much of this increase is because DOE’s cost estimate in the September 2007 request for proposals that formed the basis of the December 2008 contract between DOE and SRR was not accurate or comprehensive. Legacy cleanup at Los Alamos is currently estimated by the Lab to be around $2-3 billion. This is required to be complete by 2015 by a consent Order agreement with the State of NM. This estimate includes the Lab’s version of cleanup, which is leaving most the waste in the ground perched above our aquifer. Actually removing the waste is estimated at $20 billion. The final decision on what type of cleanup will be made by the State, which would like to have you the public’s input. 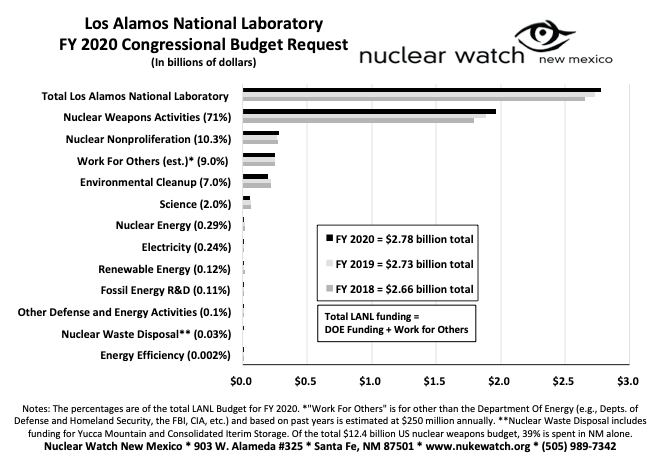 Cleanup at Los Alamos is one project that needs to cost more. While being narrowly correct, LANL PR man Kevin Roark is misleading when he claims [in a June 25, Letter to the Editor of the Santa Fe New Mexican newspaper] that plutonium pit production will not take place in the new Chemistry and Metallurgy Research Replacement Project (CMRR). What he fails to disclose is that the Lab is not building just one facility, but instead is creating an integrated manufacturing complex for expanded production for which the CMRR is absolutely key. This complex will consist of LANL’s existing production facility “PF-4” with ~$300 million in upgrades; CMRR’s already completed first phase, the $400 million “Rad Lab”; and the future $4 billion CMRR “Nuclear Facility,” now being debated. The Nuclear Facility will be literally next door to PF-4 and linked to it via underground tunnel. While pits are physically manufactured in PF-4’s glovebox lines, the Nuclear Facility’s central missions of “materials characterization” and “analytical chemistry” are essential operations that ensure “weapons-grade” plutonium and pit production quality control. The National Nuclear Security Administration’s own documents show that the Nuclear Facility is being specifically sized to support expanded production of up to 80 pits per year, quadruple LANL’s currently approved rate. It is also planned to have a vault for up to six metric tons of “special nuclear materials,” capable of storing around 1,000 pits. Roark must think that New Mexicans are naïve enough to accept the Lab’s claims that the CMRR is all about “science” even as LANL becomes more and more a production site. Sadly, this is only part and parcel of the substantial rebuilding of the U.S. nuclear weapons production complex, which will also include a new $3.5 billion Uranium Processing Facility in Tennessee and a new privately financed Kansas City Plant for production of the 1,000’s of nonnuclear components that go into a nuclear weapon. Many New Mexicans hoped for serious mission diversification at Los Alamos, which some $5 billion sunk into its plutonium infrastructure will almost certainly shut the door on. Schools in Santa Fe and all across the country are being closed due to lack of funding. Nevertheless, our government is preparing to spend some $10 billion to build new production plants even as we are purportedly working toward the declared long-term national security goal of a nuclear weapons-free world. To get there, citizens need to push the politicians to meet the needs of everyday people, not those of the vested nuclear weaponeers. A Bargain – But At What Cost? I only now happened to run across the article below from the Los Alamos National Laboratory Nuclear Weapons Journal about how the remanufacturing of Fogbank was reestablished. As dated as it is, I think its implication is very important that existing programs are more than sufficient to keep the nuclear weapons stockpile safe and reliable, until eventual disarmament. You may recall that the loss of Fogbank was a bit of a crisis that seriously delayed the W76 Life Extension Program. It had at various times been used as rationale for why existing LEPs would not work in the long run because of necessary changes to materials, loss of knowledgeable workforce, etc. By extension this was used to argue why Reliable Replacement Warheads should be designed and built. I was in Washington, DC last week and heard a number of congressional offices express support for the CMRR-Nuclear Facility, indicating what we already know, that it will be very difficult to defeat directly. However, the issue of costs is another matter, and I have some hope that the Nuclear Facility can die a death of 1,000 cuts. For example, while in DC I met with a staff person knowledgeable about DOE project cost accounting requirements introduced by the Senate Armed Services Committee. I expressed my concern that LANL could implement its first segment of CMRR-Nuclear Facility construction without having come up with total costs, thus steamrolling the project. [Reminder: we are now $4.5 billion for estimated total project costs and climbing.] That staffer said that sort of thing will not be allowed to happen. Further, while being in favor of some advance site prep, that staffer said LANL would not be allowed to construct the concrete batch plant and replace 225,000 cubic yards of weak volcanic ash strata with “lean concrete” until total project costs are in. The requirements were introduced as SEC. 4713. NOTIFICATION OF COST OVERRUNS FOR CERTAIN DEPARTMENT OF ENERGY PROJECTS. I realize this is not a showstopper, but it is something. It should slow the CMRR-NF down some, which hopefully we can capitalize on. Further, it may provide us with ammo over the project’s tremendous and escalating costs. Nick Roth of the Alliance for Nuclear Accountability was instrumental in suggesting this cost accounting requirement to Congress. Modern nuclear weapons are comprised of three general types of components: plutonium pit primaries, uranium/lithium secondaries that are triggered by the primaries, and the 1,000’s of non-nuclear components that create deliverable weapons of mass destruction (fuzes, radar, bomb cases, etc.). The U.S. is aggressively pursuing major new production facilities for all three types. At the Los Alamos National Laboratory (LANL) in New Mexico, the “Chemistry and Metallurgy Research Replacement (CMRR) Project” will be the keystone to a revived plutonium manufacturing complex. The proposed “Uranium Processing Facility” (UPF) at the Y-12 Site in Oak Ridge, Tennessee, will be the future production plant for warhead secondaries. A new “Kansas City Plant” (KCP) in Missouri for nonnuclear components production is slated for groundbreaking in August 2010. Each of these three major new production facilities is expected to operate for the next half-century, in sharp contradiction to the declared national and global security goal of a nuclear weapons-free world. Nuclear Watch New Mexico is a staunch supporter of arms control treaties, particularly since they can be confidence building steps toward the long term goal of creating the nuclear weapons-free world articulated by President Obama. However, we fear that arms control treaties will be turned on their heads to become in effect armament treaties for the American nuclear weapons complex. We think our fears are now concretely realized by the Obama Administration’s “modernization plan” attached to yesterday’s submittal of New START to the Senate for ratification. As you probably know, the Obama plan is to increase funding for the NNSA’s nuclear weapons programs from $6.4 billion in FY10 to $9 billion by FY 2018, which is a 76% increase above the Cold War annual average of $5.1 billion. We think that is obviously a serious step backwards on the road to a nuclear weapons-free world, especially when the labs seem intent on introducing new military capabilities to existing types of U.S. nuclear weapons. There have been calls for unconditional public support of New START. Yet current political realities are that New START will be heavily conditioned by both the Obama Administration and the Senate to include the revitalization of the U.S. nuclear weapons complex. In concrete terms, this means dramatically increased funding for huge new production plants for plutonium, uranium and nonnuclear components, respectively the Los Alamos CMRR-Nuclear Facility, the Y-12 Uranium Processing Facility and the new Kansas City Plant. It also means future aggressive Life Extension Programs that will substantially modify the nuclear explosives package, a serious threshold that we have not yet crossed (and which could effectively recreate the Reliable Replacement Warheads that NNSA sought but Congress rejected, but by another name). We also need to remain aware of the failure to ratify the Comprehensive Test Ban Treaty in 1999, but which nevertheless profited the nuclear weapons labs and complex by some $100 billion to date under the Stockpile Stewardship Program to compensate for the loss of underground full-scale testing. We don’t question that appeals for public support of New START should go forward. But as NGOs we are also entrusted with public responsibility to provide a fuller picture. We argue that certain conditions for New START ratification, such as increased funding for new production facilities, LEPs and stockpile work, should be publicly explained, and lead to qualified instead of unconditional support of New START ratification. Santa Fe, NM – Yesterday President Obama submitted the new bilateral Strategic Arms Reduction Treaty (START) with Russia to the Senate for ratification. At the same time he submitted a modernization plan required by Congress that “includes investments of $80 billion to sustain and modernize the [U.S.] nuclear weapons complex over the next decade.” Given that two-thirds of the Senate is required for treaty ratifications a large political fight was always expected over a second attempt at ratifying the previously rejected Comprehensive Test Ban Treaty (CTBT). However, last December all 40 Republican senators plus one independent wrote to President Obama demanding modernization of both the stockpile and complex as a condition for New START ratification. Meanwhile, the prospects for ratification of the CTBT (first proposed by Prime Minister Nehru of India in 1954) look increasingly dim. 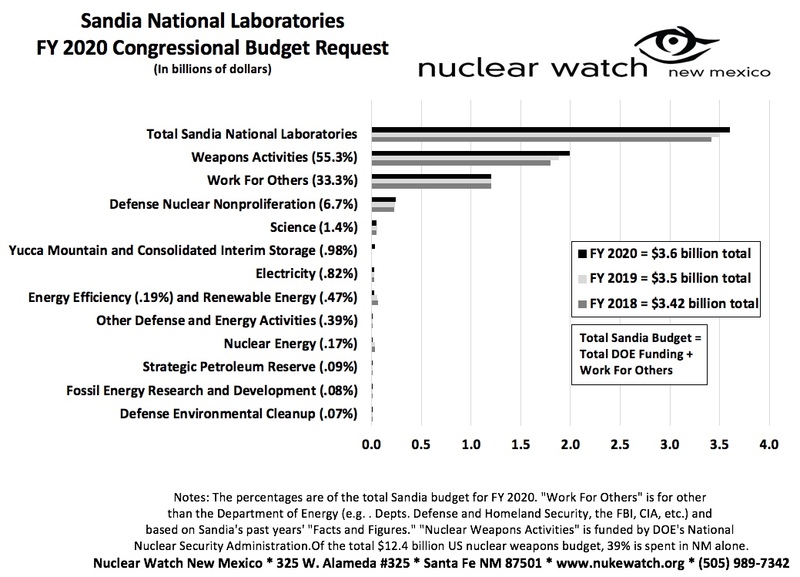 In response to Republican demands, the Obama Administration plans to increase funding for the nuclear weapons research and production programs of the National Nuclear Security Administration (NNSA) by more than 40% from $6.4 billion in FY 2010 to $9 billion by 2018. In turn, $9 billion is 43% above the average annual cost of $5.1 billion during the Cold War for analogous Department of Energy nuclear weapons programs. U.S. nuclear weapons will undergo extensive life extension programs in the coming years to ensure their safety, security and effectiveness. Maintaining a credible nuclear deterrent requires that the United States operates a modern physical infrastructure and sustain a highly capable workforce. That may seem intuitively logical on the face of it, but NNSA and the nuclear weapons labs are subtly changing the frame of debate to favor their own interests. Independent scientists have repeatedly found that the nuclear weapons stockpile is safe and reliable and can be so maintained by existing life extension programs. Past NNSA budget requests repeatedly invoke a “reliable” stockpile, but its FY 2011 request is full of references to an “effective” stockpile. NNSA Administrator Tom D’Agostino claimed at a recent presentation to international delegations at the United Nations for the NonProliferation Treaty Review Conference that the U.S. is meeting its disarmament obligations in good faith. At the same time, he repeatedly stated the U.S.’s need to maintain an “effective” stockpile. When asked what effective meant he replied it meant having confidence in the nuclear weapons stockpile underpinned by the right mix of infrastructure and people. In order to extract increased funding, NNSA and the nuclear weapons labs are trying to shift the debate over maintaining the stockpile from technical arguments over warhead safety and reliability to subjective arguments over maintaining an exorbitant research and production complex and workforce. This will not only cost enormous sums of money, which is what the labs seek, but will also perversely undermine confidence in the stockpile because of planned changes, including new military capabilities, that will be made to existing, previously tested weapons. Giving the nuclear weapons labs a blank check contradicts Obama’s declared national security goal of a future nuclear weapons-free world. Instead, he should be redirecting the labs into dramatically increased nonproliferation programs, cleanup, and meeting today’s national security threats of nuclear terrorism, energy dependence and climate change. The one-page unclassified summary of the Obama modernization plan for the stockpile and nuclear weapons complex. The average annual cost of $5.1 billion during the Cold War for DOE defense programs is derived from Atomic Audit, The Costs and Consequences of U.S. Nuclear Weapons Since 1940, Steven Schwartz, et.al., Brooking Institution Press, DC, 1998, Table A-2, p. 561 (adjusted for inflation). Of particular interest are cited Los Alamos Lab viewgraphs that state “Technically: there is little difference between a ratified CTBT, and the current testing moratorium” and “There are several ways to sustain capabilities… Get more money.” The point is that the nuclear weapons labs are fully aware that treaty ratifications are an opportunity for them to secure more funding, as they did in the build up to the 1999 ratification process that rejected the CTBT.